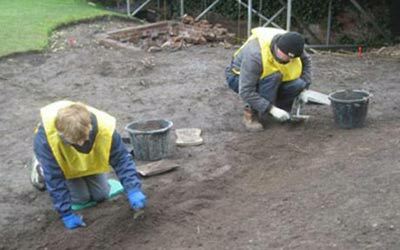 The dig focuses on three areas of the property, which Shakespeare bought in 1597. Fragments of pottery and broken clay pipe have already been retrieved from a muddy hole on the site, which they claim could yield some of the most significant discoveries about Shakespeare in decades. The dig focuses on three areas of the property, which Shakespeare bought in 1597 when he returned to his home town from London having achieved fame – including the so-called knot garden at the rear of the building. Dr Diana Owen, Director of the Shakespeare Birthplace Trust, which owns the site, said: “We do not know if the knot garden was an area used by Shakespeare – it may have been a yard simply used by his servants. Kevin Colls, from Birmingham Archaeology, added: “Through documentary evidence we know Shakespeare lived at New Place but we have very little information regarding the layout of the house and gardens at this time. “Through archaeological fieldwork, in particular the excavation of structural remains and the recovery of artefacts, we hope to fill in the blanks. Until October, visitors will be able to watch archaeologists and volunteers at work as they excavate the remains of the house, which was knocked down in 1759. Experts hope to unearth evidence to support theories that Shakespeare wrote many of his most famous works at the property.